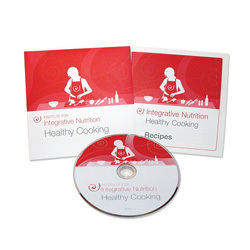 The Integrative Nutrition healthy cooking DVD was one of a series of DVDs developed by Kat Georges Design. Each DVD in the series included cover, on-disk and insert graphics, designed to elimintate the need for environmentally wasteful plastic casings. The fresh, clean look reflected the Institute's "keep it simple" motif, and was used as a promotional item to interest thousands of new students.